The Borobudur temple in Central Java. This Buddhist temple is one of the largest existing Buddhist monument in the World. 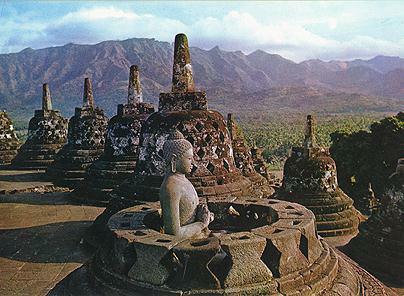 Borobudur was built in the 9th century during the Syailendra dynasty. With the decline of Buddhism in Java, the temple was abandoned and only rediscovered in 1814 when Raffles governed Java.. Nearly 1500 panels on the terraces illustrate Buddhist teachings and tales while over 400 Buddha images sit in chambers on the terraces. Ther is a myth with the Buddha images inside the stupas. Anyone who can touch the image will get luck. I have touched one of the images, and I consider myself a lucky person.